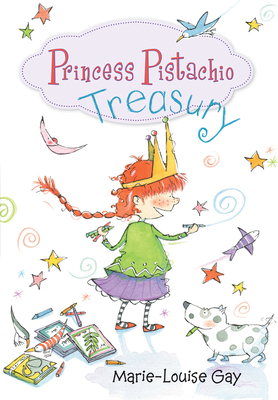 A grand collection for early readers transitioning to chapter books, this treasury gathers three madcap Princess Pistachio titles into one divine volume. New fans will cheer for Pistachio as she "discovers" she may be kidnapped royalty in Princess Pistachio, navigates a disastrous day of minding her baby sister in Princess Pistachio and the Pest, and gets caught up in fame when her dog becomes a theater star in Princess Pistachio and Maurice the Magnificent. Written and illustrated by the internationally bestselling author and illustrator Marie-Louise Gay, the Princess Pistachio Treasury features a ribbon bookmarker, gold foil stamping, and a reinforced spine for a classic treasury feel.